Discover Canada’s scenic maritime province Newfoundland on this 11-day trip. Travel through small towns steeped in history far from the bustle of big city life, and down roads with sweeping views of wave-battered headlands, steep cliffs, and tranquil beaches. Explore fjords bursting with marine life by boat, and watch massive icebergs on their yearly migration. Nestled amid the hills on a winding, quiet back lane, Fishers' Loft is a 4½ star inn, overlooking the old fishing and boat-building harbour of Ship Cove. A picturesque fishing port in Port Rexton, the inn is in the perfect spot to enjoy nearby Skerwink Trail, Trinity Bay or head to Terra Nova National Park and Golf Course. Upon arrival in St. John’s, pick up your rental car at the airport. After settling in, get out and explore the oldest city in North America. This historical, waterfront city sits on the steep slopes of a snug and sheltered harbour, with brightly coloured row-houses lining the hilly streets. It is home to artists, Celtic musicians, unique eateries, and has the welcoming, small-town feel that for which Newfoundland is famous. You have an exciting day ahead! Explore the best of St John’s from history to its culinary delights. You have the following experience included to help orient you to this exciting city. Join a local tour guide and small group, on a 3-hour historic tour of St. John’s and Cape Spear. The city will come alive as you discover Newfoundland’s culture, history, music, and language. This is a perfect overview to start your trip! Insider tip: We recommend visiting The Rooms, Newfoundland and Labrador’s largest public cultural space. Immerse yourself in Newfie culture with rotating exhibits, events and exceptional dining! Travel south along the Avalon Peninsula, to explore the beautifully rugged and wild coastline. See countless natural wonders comprised of stunning cliffs, sea caves, and waterfalls. Keep your eyes open for puffins, humpback and minke whales. Join a boat tour into Witless Bay, led by a senior naturalist guide. Get up close to whales, icebergs, and to marvel at the beauty of the coastline. 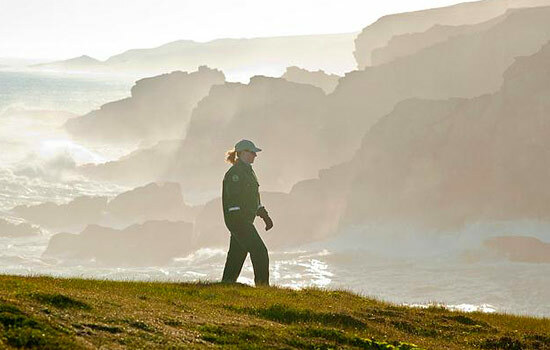 Join an expert guide to explore Bay Bull’s hidden gems at your own pace. Get up close to wildlife and take your time to admire the beautiful scenery. No experience necessary, and all equipment is provided. 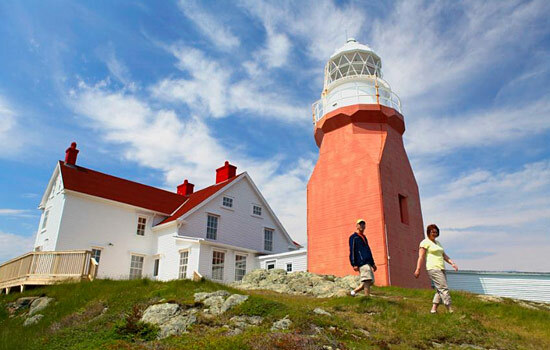 If you would like a true taste of the Avalon Peninsula, ask your Vacation Advisor about the Ferryland Lighthouse. Experience an award-winning homemade picnic at beautiful Ferryland Head and enjoy a serene 30-minute walk along a natural isthmus, surrounded by the sea. Insider tip: Prime whale watching season is mid-June to mid-August. Whales may be spotted after this time, however, it would be a bonus. Keep your eyes peeled! Depart St. John’s along the scenic Conception Bay coastal drive – on a clear day you will be able to see the still active Bell Island Lighthouse. Continue to the charming town of Brigus – once the residence of the world famous northern explorer Captain Bob Bartlett. 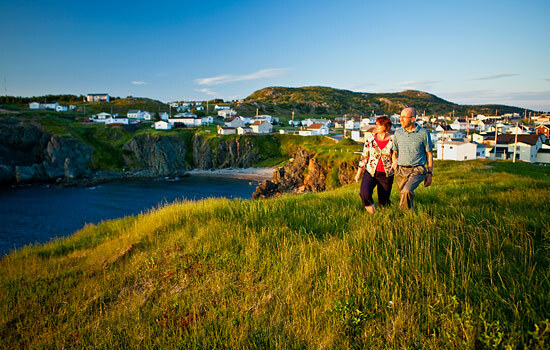 Continue north and then east to the Bonavista Peninsula and onto the cultural capital of Newfoundland – Trinity. Trinity is renowned for its unique historical architecture including the Ryan Store, Hiscock House and the Blacksmith Museum. Enjoy a 3-course set menu described as “casual fine-dining” prepared by local chefs using only the freshest local ingredients and seafood. As more than just a place to eat, experience a uniquely Newfoundland atmosphere with relaxed and friendly service. “O buono vista!” or “Oh happy sight!” were the first words from Italian explorer John Cabot as he discovered North America in 1497, arriving in the area that would become the town of Bonavista. Get out and enjoy the magnificent beauty and history of this area today. Be amazed as you watch whales feed, play and migrate through the Bonavista Peninsula. See fin, humpback, sperm, minke, and pilot whales and, although rare, orcas too. You may also see various species of dolphins and porpoises, eagles and offshore sea birds including puffins and northern gannets. Today you’ll travel back in time, as you head out with a local skipper whose family have fished these waters for generations. You’ll explore enchanted and long-deserted fishing communities plus beautifully remote scenery, as your skipper explains the struggle of these villages to survive through time. Choose to return by boat, or hike back over the highlands, alongside tumbling streams, to New Bonaventure. For the remainder of the day, you may like to independently hike one of Bonavista’s scenic trails – we recommend the Skerwink. Or visit one of the closest land viewing sites for the Atlantic Puffin in North America. Keep your camera ready for puffin, seabirds, whales, bergs, caves and arches. Finally, visit the filming locations of The Shipping News or Random Passage and imagine yourself on set. Insider tip: The town of Trinity offers unique evening entertainment and a look into Newfoundland culture with locally produced theatre. Ask your Vacation Advisor about arranging this unforgettable experience. 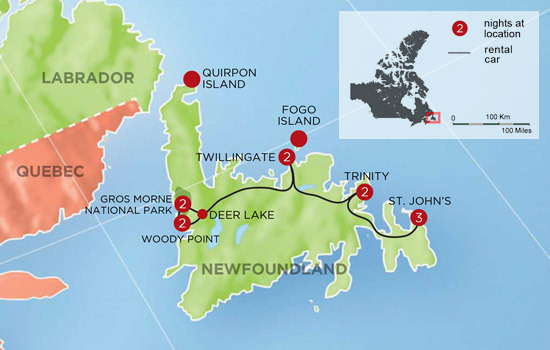 Depart Trinity and spend the remainder of the day meandering your way to Twillingate, along winding, coastal roads Explore Terra Nova National Park – a classic Newfoundland landscape of sheltered bays, rugged ocean coastline and rolling forested hills. Finally, arrive at the quaint fishing village of Twillingate and the 1876 Long Point Lighthouse – still active today. Insider tip: Before departing for Twillingate, spend your morning with a local historian, as you walk the lanes of Trinity and discover its 500 years of history. Ask your Vacation Advisor for more details. Relish the opportunity to explore Twillingate, which embodies the quintessential Newfoundland out-port character – stunningly-rugged coastline, historical, picturesque streets, and lush countryside roads. If you haven’t already spotted an Iceberg, you may be in luck today! Head out on a boat tour to marvel at these sparkling, 12,000-year-old giants as they float on their epic journey from Greenland. Even once prime Iceberg season is over, you’ll still enjoy seeing beautiful coastal scenery and a range of marine wildlife from whales and dolphins to seabirds. Peak iceberg watching runs from early June to early July. Insider tip: It’s no secret that the people of Newfoundland are talented musicians and gracious hosts. Ask your Vacation Advisor about arranging an evening of fantastic music, comedic skits, and delicious Newfoundland cuisine while in Twillingate. Leave behind the Central Region of Newfoundland and head west through a vast expanse of lush forest and contrasting scenery. Drive north along the Viking Trail to Gros Morne National Park – designated an UNESCO World Heritage Site in 1987 for its impressive geological features. Sample the top 4 restaurants in Gros Morne, and meet the owners of the establishments. Enjoy the freshest local seafood plus wine pairings. Cultural discovery and evening entertainment are also highlights. Exploring Gros Morne National Park should be a highlight of your adventure here in Newfoundland. Included is an adventure that will provide plenty of photographic opportunities. 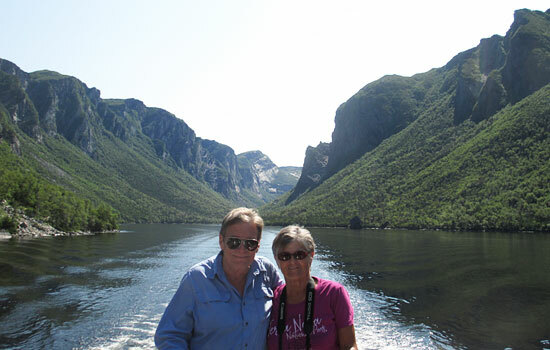 Included today is a spectacular Western Brook Pond Fjord Boat Tour – the only way, other than by helicopter to see the spectacular Western Brook Gorge. Enjoy a 45-minute boardwalk stroll to the dock before enjoying a leisurely cruise into the gorge – be humbled by nature as you see the dramatic ravine-like sides of this inland fjord tower over 600 metres above you. The water here is some of the purest in the world. Insider tip: If you haven’t had a chance to hear live music in Newfoundland, this is the time. Let your Vacation Advisor arrange an evening of entertainment that will have you jigging the night away! A short hour-long drive brings you to Woody Point today. Although just across the bay from Norris Point, you’ll find the scenery very different. Get out to explore nature hikes such as the dramatic Tablelands or spectacular Green Gardens, visit the Parks Canada Discovery Centre or simply enjoy the relaxing small-town atmosphere of this seaside town and its historic buildings. Ask your Fresh Tracks Canada Vacation Advisor about arranging additional days to drive north along the Viking Trail to visit St. Anthony and the Quirpon Lighthouse Inn. 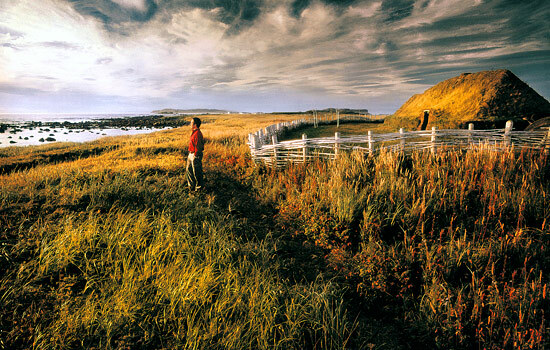 On the way, explore L’Anse Aux Meadows UNESCO site, showcasing mysterious Viking remains. On Quirpon Island, you will stay in a refurbished light-keeper’s residence, on the northernmost tip of the Great Northern Peninsula. In season Quirpon Island is one of Newfoundland’s best locations for iceberg viewing as they drift the Labrador Current on their journey south. The waters here are a rich feeding ground, meaning excellent whale viewing. Expect to see minke and humpback whales in season, as well as orca and right whales. With just a guide head out for a full day of adventure. This experience is perfect for those seeking local knowledge of plants, animals, or geology – your guide will be an experienced wilderness leader, with a wealth of knowledge. Hiking destinations vary: including a 9-hour hike along the earth’s inner mantle on the Tablelands or an easier 4-hour hike to the coastal wonder, Green Gardens. Ask you Vacation Advisor to help pick the ideal hike for you. A picnic lunch is included. On this full day experience, explore a specific community in the park and dig deeper to unravel life in a small, Newfoundland community. Each day trip features a scenic trail, lunch at a local hot spot, and an artist studio visit along with demonstration. Featured communities are Norris Point/Rocky Harbour, Woody Point, Trout River and Cow Head. Includes transportation, lunch, snacks, guided walk and artist demonstration. Say goodbye to the awe-inspiring island you’ve gotten to know so well. Depart Woody Point and drive for an hour to Deer Lake airport where you will drop off your rental car. • All tours and activities are subject to availability. • St. John’s Sightseeing Tour runs from June 1. • Ferryland Lighthouse picnic runs from June 1, Wednesday to Sunday. • Trinity Historic Walking Tour starts running on July 1, Mondays to Saturdays. • Trinity Plays, Pageants, and Dinner Theatre are available from June to September, showtimes vary. • Twillingate Iceberg Tour runs until September 15. 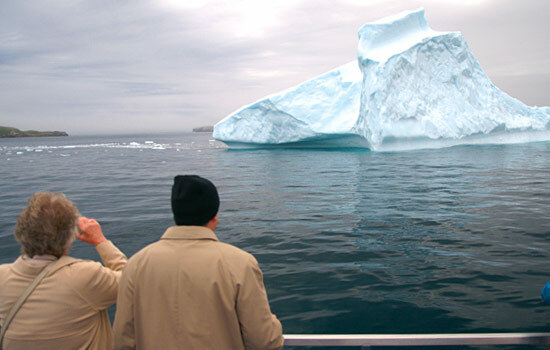 Peak iceberg watching runs from early June to early July, outside of iceberg season this tour is focus on nature viewing. • Twillingate Dinner Theatre runs from late May to late September, Mondays to Saturdays. 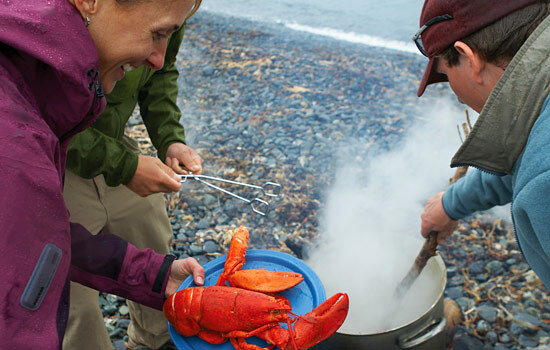 • Gros Morne Tasting Tour is available from June to September, Tuesday, Thursdays, and Saturdays. • Gros Morne Live Music runs from June to mid-September, Mondays, Wednesdays and Fridays. 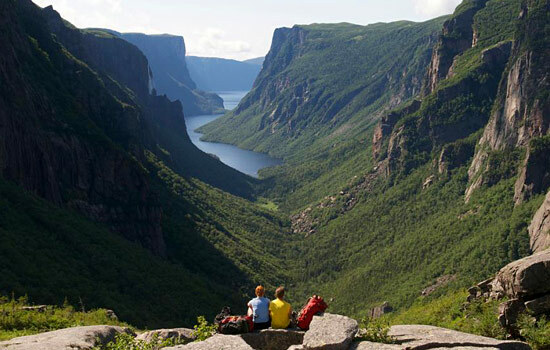 • Gros Morne Guided Hike runs from June 1. Hiking destination availability varies. • Full Day Cultural Explorer Tour runs from June 15 to end of September. Destination availability varies. • Norstead Village is open from June 1 until September 30. • Quirpon Lighthouse is open until September 20. • Add on a boat ride to Nova Scotia and keep exploring Canada!